The clues (or mis-directions?) begin on the cover. The author’s name is “Cam Kaskgn”. The name appears to be a pseudonym. Much has been discussed about Jef Raskin being the true author. He was the 31st employee at Apple and the Mac (Cam spelled backwards!) was his brainchild. AND the number of letters works out. You can google him yourself for more details. The prize and the story are all tied to apples, so it might make sense. It’s all very curious, but perhaps only a rabbit hole that distracts from solving the main puzzle. Though a relatively small book, it’s packed with clues, hints, codes, puzzles, anagrams, computations, plays on words and I’m sure some other things I’ve missed. It’s also packed with mis-spellings and apostrophe abuse. I’m not sure if those are clues or just irritating sloppiness. Of course it was 1982ish so the typewriter probably didn’t have spell/grammar check. Page 2 provides us a few more clues. “Illustrated by Karen Wagner”. Going back to the author’s name, “Kaskgn” is an alphabet soup of Karen, Wagner, Raskin. Curious, again, but helpful? Also on page 2, we find “Fantasy Press”, the mysterious seemingly non-existent publishing company. Publication date is 1982, the same year that Raskin left Apple. According to his LinkedIn profile Juhas was a custom jeweler at a jewelry store in downtown Grand Rapids, Michigan (Preusser Jewelers) from 1978 – 1985. In 1985 he became the President/Manager (until 2005, when he opened his own Jewelry store: Juhas and Sullivan). The profile also shows he received a BS in Math from Grand Valley State University. So here’s a guy that’s smart, motivated and moving on up. My hunch is that he’s the author. The BS in Math is very telling, in my opinion. Jef Raskin (the Mac guy) received a BA in Math. I suspect that, during the 1970s and 1980s, Juhas was very interested in Raskin’s career and computer developments. It could be that the whole Golden Apple Tale was a tribute to Raskin and the Mac (rather than being something that Raskin himself did). I am not the author. Many people have contacted me over the years and those people and myself have not heard from Cam since the book was released. Sorry to disappoint. • The phrase “PLACE IN ORDER” can be unscrambled from letters hidden in the illustrations. • The words “PINE TREES” are found by putting together the bold letters from the state names. • The word “CASSIOPEIA” is decoded from the map of the states. But a shovel works best. Miss Muffet’s meal didn’t cost a dime. Before you decide to exit and rest. to give you a clue. They all look like hay stacks. In the rain, wind, or snow. So don’t get to smart. So look that far down. So don’t treat it lightly. or go to your head. you might wake one up. Conveniently, “PLACE IN ORDER” has the same number of letters as there are stanzas in the poem. So I re-arranged the poem, matching the stanza to the letter. This is the result. Note that some letters repeat (R and E) so it’s possible that the stanzas are “flip-flopped”. There’s no punctuation in this stanza and it drives me crazy. I didn't make sense of this sense until I had worked on the second stanza (see below). Some have suggested that the first letter of each line tells you the city “ALTO”. Alto, Michigan is near Lowell, Michigan which kind of sounds like "Low lands". Interesting... let’s jump into the second stanza for more clarity (including how I jumped to Michigan). I chose Grand Rapids, Michigan the mailing address found on page 3, the largest city near Alto and Lowell, and home to Jeffery Juhas (the jeweler who made the golden apple). “Miss Muffet’s meal” that "didn't cost a dime" was free. And what did she eat? Curds and whey. "Free whey" = freeway. Let’s go back to page 3 and take another look at that PO Box. It’s not 1196. It looks more like 1 196, which looks like I 196, which is a freeway that runs through Grand Rapids. But where to start? Let’s go back to the first stanza where the sun rises in the…EAST. Looking at I-196 you’ll find its starting point in the East (and if you look a bit more to the East you'll see Lowell and Alto). That’ll be our starting point to measure 10.25/11 miles. Converting from leagues to miles doesn’t appear to be such an easy thing I guess. Depending on whether they’re nautical or not and based on which era and other factors, the conversion can be different values. So I’m looking at either 10.25 or 11 miles as my distance because, as a wise man (FF) once said, "Indecision is the key to flexibility" or something like that. Anyway, where do we find ourselves after going roughly 10.25/11 miles? At 10.25 we're exactly at exit 70, so we should “decide to exit…” But what about “...and rest”? This might be a reference to eternal rest. If you’ll notice on the map, there’s an Indian Mounds Dr near the exit (or exactly 11 miles from our origin). Indians featured prominently in this story so maybe that’s a hint. There were dozens of Indian mounds in Grand Rapids. They were Indian burial sites dating back to the first century AD. Let’s head there and see what happens. But which direction? North or south? At this point the poem appears to move into astronomy…and how. On page 28, there are multiple constellations visible. Much of the story takes place in the autumn. 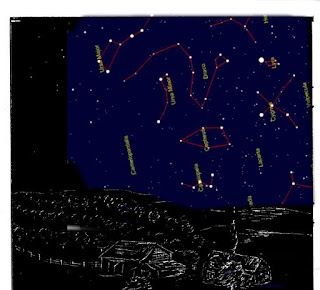 So I took a look at the autumn night sky in 1982 and compared it to the image on page 28 (overlay on the right). The constellation “Draco” is important here for several reasons. Draco is the representation of Ladon, which in Greek mythology, was the serpent-like dragon in the garden of Hesperides that guarded...wait for it…the golden apples. So let’s be very quiet, lest we wake him up. He also points us in the direction we need to go because we’d have to look toward the northern horizon to see him. So we’ll travel along Indian Mounds Dr to the north. Sounds like we’re almost there! Indian Mounds Dr goes north for a while, but shortly there’s a turn around that will bring us back south. Let’s stop at this turn and explore a bit. This part is extra tricky because we’ve reached one of those stanzas that might be flip-flopped. Maybe it’s the wrong “E”??? We’re also moving into BOTG territory I think. And we’re using the night sky as a guide because "at this point in time" = night and "they all look like hay stacks" = the silhouettes you'd see. And we’re keeping in mind “PINE TREES” (the bold letters from the state names). A presage is a sign or warning that something, typically something bad, will happen. Great. This stanza is still up in the stars (perhaps). The second part of this stanza may be a reference to the constellation of Cassiopeia. 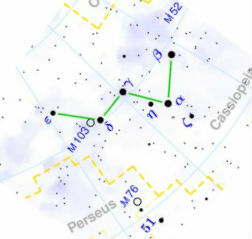 Cassiopeia has 5 main stars. If we do some rounding, three of the constellation’s stars are magnitude 2 and two of the stars are magnitude 3. But again, BOTG looking for a presage? Not sure what was here in 1982, but when we stop at the "return" I found a sign (presage). It says “stop”! We’ve seen CASSIOPEIA decoded in the book and we’ve seen the constellations in the illustration. 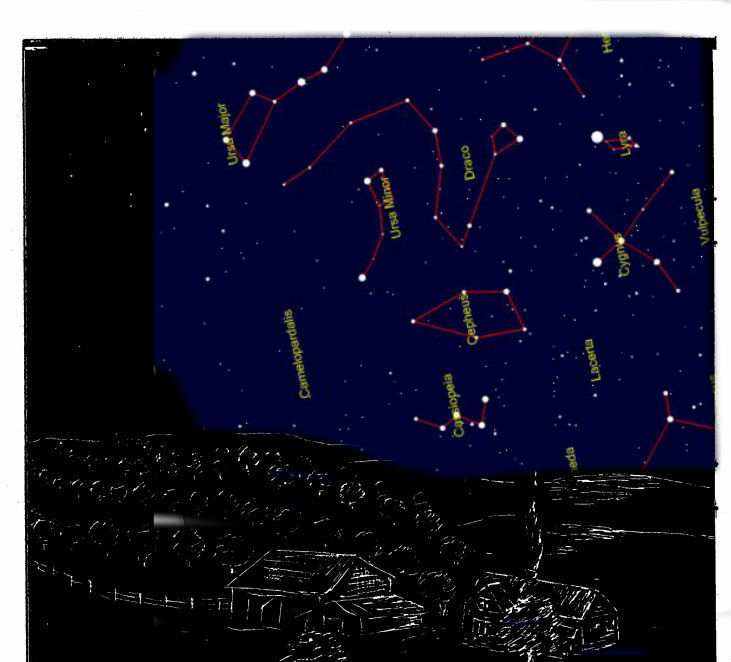 Let’s keep looking at the constellations focusing on Cassiopeia, especially where Cassiopeia would be in autumn when there might be rain wind or snow. I hate this stanza. I can’t get past mis-spellings and the overall perplexity. The clues in here must be vital. Going back to Cassiopeia, we’ve already identified two stars that are magnitude 3. The higher the magnitude, the dimmer the star. So let’s get rid of the two dimist (Delta and Epsilon) and see what happens. We’re left with three stars that make a “V” shape which seem to point like an arrow (with Alpha as the tip)! An omphalos is a religious stone artifact. In Greek, the word omphalos means "navel". Omphalos stones were erected in several places around the Mediterranean Sea; the most famous of those was at Delphi. I’ve put the constellation map over the street view at the “Return”. I tried to line up North as best as I could and based on the orientation of the constellations in the book (and Polaris). 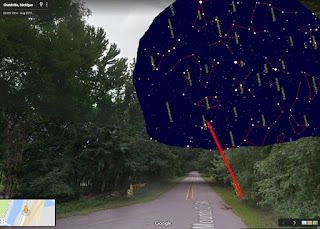 Based on the arrow shape that was the “remainder” I then drew a line from Cassiopeia to the ground ("where your return begins" because that's where "your hunt ends") . You’ll never guess what’s there. This final image is a close up of where the red line points in the previous image. Is that our "omphalos"? Dig here? Two feet down? Or mark off two feet in a specific direction? The clock in the story is at about 11:52. Do the hands tell where to dig in relation to the rock? But what about the PINE TREES?? I feel like I’m missing something. It’s been 35 years since this was published…the terrain must have changed considerably. Old trees gone, new trees there. And those posts look like they were placed there more recently than 35 years ago. If the jewel was in the ground there, maybe it was dug up by workers when the barrier was installed? That post is dangerously close to the 11:52 position. Are there clues here? Or is this just a closing congratulatory/warning stanza? I've spent considerable time exploring this area (BOTG) and have not found the Golden Apple jewel. I plan to keep looking since it doesn't take much for me to get there. Needless to say, the area has been considerably scoured. If you do venture out based on this solution and happen to find it, please let me know! It would be awesome to know of a happy ending, mostly so I can stop obsessing over this thing. Also, feel free to poke constructive holes in this solution. Maybe it's the right area, but I'm off somewhere? What about the PINE TREES which I never used? Maybe PINE TREES is the wrong anagram. What other anagrams can you find? Sometimes I get mail from searchers who ask some pretty inquisitively good questions. You've narrowed down the location to a handful of states, but can some of the clues reside outside of those states (like Florida for example)? A: The locations in the poem are limited to the remaining states. You needn't look outside of those states to construct your solution. Do the clues in the poem follow each other location-wise? A: Once you've fixed the poem, you can use the poem as a map. Hunt #2: Google Maps Challenge - SOLVED! Congratulations to Steve from Ohio who submitted correct answers to all four clues! Like many of us in the "treasure" hunting world, Steve enjoys the chase as much as the quarry. He says, "Not only do you get the thrill of the AHA moment, but it is very fun and rewarding to actually learn about the history behind the events." Great job Steve! And memories are fading away. For the tragedy that struck on Boxing day. Once you're on track you'll find what you need. Seek a sign and write what you've seen. This one should have led you to think of some sort of tragedy involving a train more than 100 years ago. A bit of googling would have eventually turned up something like this news story or interesting information about those who lost their lives on that sad day. Location: East Paris Train Wreck, December 26, 1903. Occurred near the intersection of 32nd St and Broadmoor Ave SE. Text: I would accept a few different options for this one. Steve mentioned all three! Standing at the intersection of the track and 32nd street, there are two signs that can be seen from here. 1) No Parking sign (P with circle and slash), and 2) Downhill grade (symbol of truck going downhill). The Stop on Red Signal signs cannot be seen here, though I would have accepted them as well. Might have something to say. Once you've drawn nigh you'll find a dent on the wall. Look to the left and write the first name that you saw. Miss Gherardini might have been the key to this one. 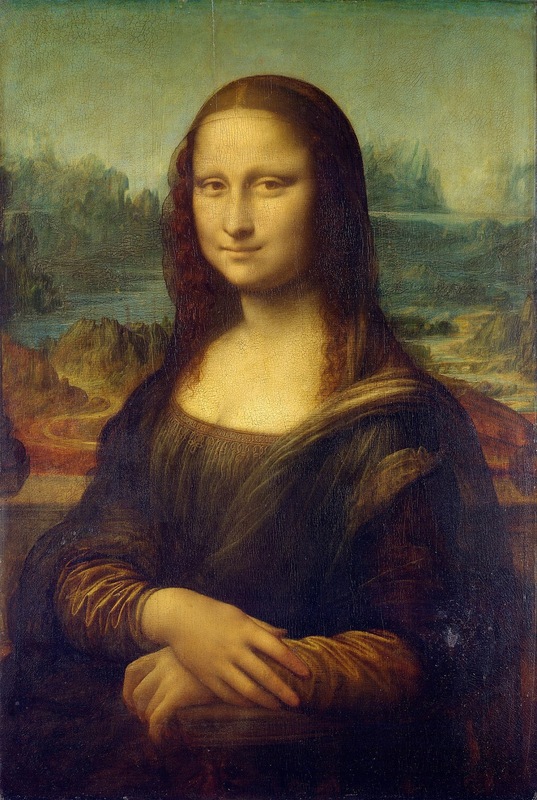 Discovering that Lisa Gherardini was the inspiration for the Mona Lisa (whose smile suggests she might have something to say) would have led you to Leonardo da Vinci. Connecting da Vinci to Grand Rapids would lead you to Frederik Meijer Gardens where the American Horse Sculptures are on display (3 sizes). The phrase "drawn nigh" also hints at da Vinci's sketches which were drawn and "nigh" means "near" or "on the left". As you get closer to the smaller statues using Google street view, you'll see plaques on the wall. (Google has used "street view" in many parks and non-"street" places around the world. Check it out!). The middle plaque has the name Charles Dent (dent on the wall). To the left is the plaque with "Nina Akamu". Nina Akamu is the artist/sculptor who brought Leonardo da Vinci's horse to life. Location: Frederik Meijer Gardens & Sculpture Park, Grand Rapids, MI American Horse Sculptures. Was something Bob never said. So don't let it go to your head. Once you've found where he is, there's really only one way in. Look to the right and take note from beginning to end. This one proved to be a bit tricky for quite a few people but Steve nailed it. "It was just a line" indicates that "You're so fine" was a line a from a song. In fact, it was the title of a song by The Falcons. "Bob" was Robert Manardo, one of the founding members of The Falcons in 1955. He was drafted into the military and left the group in 1957 before "You're So Fine" exploded onto the charts in 1959. Hence, Bob never said "You're so fine". "There's really only one way in" has a couple of meanings here. The first is as a hint to the cemetery where the only way "in" is to die. The second meaning hints at the place you're looking for on street view (which also ties in to the text you needed to find)...the entrance. Since street view doesn't actually go into the cemetary, this is as far as you can get. Location: Robert "Bob" Manardo burial site. Resurrection Cemetery, Wyoming MI. A lamp that can heal. To eat a Heavenly meal. Once you've found your spot, it can be a real pane. To the left is a sign for what kind of lane? The first line of this one might bring to mind the "Beatitudes" (let your attitude be). A lamp that can heal, which hints at "Guiding Light" helps you get close, but not to the exact point you're looking for. Located nearby is God's Kitchen (a Heavenly meal). It can be a real "pane" was misspelled on purpose because you need to find "God's Kitchen" written on the window (pane of glass). From there you can see either the bike lane sign on the pavement or the "loading zone" sign on the sidewalk. You gave a hint about the treasure being north of hell, but south of paradise. Does this indicate that the treasure is in Michigan? Or are we to extend those north and south boundary lines across other states? A: I've been asked this question more than once. Directly answering it might give away more than I'm inclined to at present. 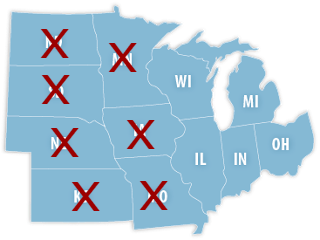 But in response to this question, I'll eliminate two more states from consideration: Minnesota and Iowa. Are the clues contiguous, as in is clue 2 close to clue 1 location and so on? A: No, the clues are not connected nor are they related to each other. When looking at Google street view, Google has placed street names on the surface of the streets. Are those street names part of the answers? This is my first "Google Maps Challenge" hunt. Nothing to buy - it's free! Everything you need to get started is right here. Prize: $25 Amazon gift card. (Valid only in the US). This Google Maps Challenge takes place in the greater Grand Rapids, Michigan area. I've created a set of four clues that will lead you to specific locations in the area. There are four specific locations that need to be found. All four clues must be solved to claim the $25 Amazon gift card. Each set of clues has a two part solution. The first part of the solution is the location related to that clue. The second part of the solution is the text you need to find. You'll need to be using street view to find the text. So you think you've solved it? How do you claim the $25 Amazon gift card? If you follow these instructions precisely and communicate your solution as specified, the gift card is yours! All four clues must be solved to claim the $25 Amazon gift card. Subject line of your email: Hunt #2 Solution. As of September 16, 2017 the cache has been found BUT the gift cards have not been claimed! The finder has 30 days to claim the gift cards. If the gift cards are not claimed per the instructions in the book (and found on this site) by 11:59pm EST on October 16, 2017 this will become a legit armchair treasure hunt - no travel needed to win the gift cards! The gift card balance is now locked in at $700. The balance will no longer grow. This prevents a finder from delaying their claim in an attempt to grow the reward. Stay tuned for additional details and guidelines if the prize is not claimed! The gift cards still have NOT been claimed. The finder now has 2 weeks to claim the gift cards. The gift cards were not claimed by the deadline. This is now an armchair treasure hunt. No need to physically retrieve the trove to claim the $700 in Amazon gift cards. Good vs. Evil - Which side are you on? A war has been raging for thousands of years. Everyone is a soldier. Even if you think you aren't, you are. The thread is woven throughout history. We see it in our stories, our movies and every facet of our lives. We see it over and over again. Good vs. Evil. Which side are we on? 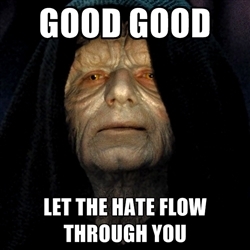 We'd all like to think we're on the good side (well...hopefully). But maybe that's our first mistake. Our pride gets in the way and clouds our thinking. Here's our second and fatal mistake: in the pursuit of our self-righteous "goodness", do we hate anyone? Now that we've quickly found creative ways to justify and excuse our hate (I mean it's not really "hate", right? After all they're the "evil" ones), let's consider how we can deceive ourselves. If we think we're right and noble and just that tarnishes our thinking. We move into a dangerous series of justifications. That makes others wrong. That makes others our enemies. That makes others "evil". Love has been said to be the way to end all this bitterness and hate. Love will unite us. Love is the answer. Maybe we should scrutinize our love. Do we love our enemies? Sure we do, right? Cue our quick thinking, creative, self-reinforcing thought processes again. Let's explore our "love". Do we mock our enemies? Do we wish bad fortune upon them? Do we look down on them? Love has no room for any of this. Perhaps our "goodness" is just a guise. What truly lurks beneath is a covert agent of evil. It doesn't have to be that way. It's time to fight the good fight. My answer: Page numbers are irrelevant and not important. 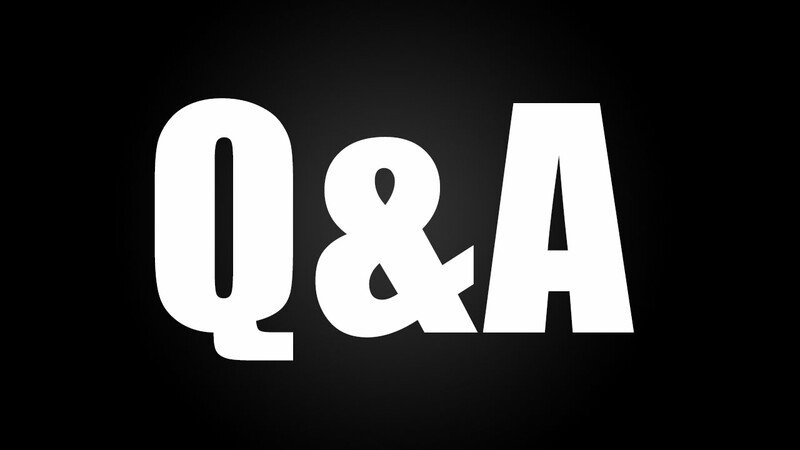 Q: You narrowed down the search area in one your blog posts. Would you be willing to narrow it down even more? I mean the prize really isn't that big to be searching such a large area. My answer: I've got to hand it to you for asking. Yes, I'd be willing to narrow it down even more. Q: Forrest Fenn has said that you have to follow his clues in order and that you probably won't be able to solve past the first couple by using just a map and the poem. Are you willing to say anything similar about your clues? My answer: Unlike Forrest Fenn's poem, mine has to be "fixed" first, but after that the concept is the same in my view. I'm not sure if I fully agree with the second part of your paraphrasing. Q: Are you sure the "chest" is still there? My answer: As I respond to this question...no, I'm not sure. But I will be sure within the next 30 days. If you have questions you can send them to me via my gmail address... readandseekadventures. Searchers for Forrest Fenn's treasure might see a few interesting things in this photo. We've all seen the "brave" and "wood" discussions. But a "brave" made of "wood" eating ice cream which might be... "worth the cold"? 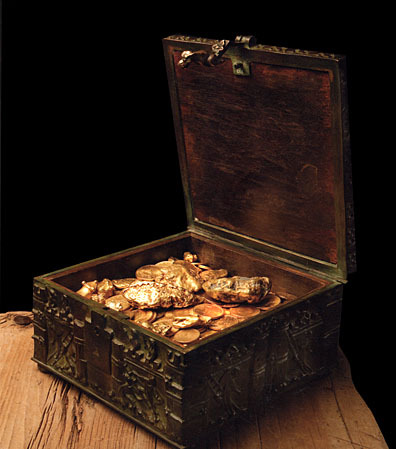 In March 2013 I learned about Forrest Fenn’s hidden treasure thanks to the Yahoo homepage. It was all a lucky coincidence, however, because that was the default homepage on my Internet Explorer browser and I never use that browser. I needed to use Internet Explorer for a specific website I was visiting - a site likely built in the 1990s and not updated since. 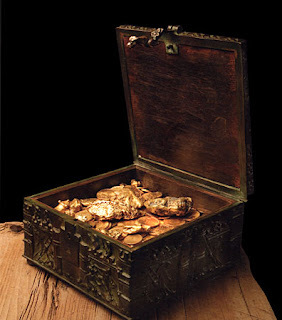 So I popped open the browser and there was a box of gold staring me in the face. I read the article, did a little internet searching and in 30 minutes or so I figured I might actually have a chance at finding this thing. That was four years ago today. Some people don’t believe in coincidences. I might not either. As I'm about to embark on what may be my last search, I'm reflecting on some of the many things I've learned along the way. A quest never ceases. It just changes direction. The end of the rainbow isn’t always the end. There are some places where you should never go alone, unless you ought to. If you look too quickly down, you’ll be staring at your feet. Tomorrow never comes. It’s always today. Clues are not hints and hints are not clues. And neither will get you very far if you don’t know where you’re going. If you start at the beginning you’ll likely get lost. Weather in the mountains can change on a dime. A blaze is a blaze unless it’s not there. It is fun to arrange words in such a way that you have to smile at the end of a sentence. Autobiographers always lean toward the subject. It is important that I drink a martini at least once a year so I can continue to remember why I don’t like them. All that I could remember was that I was not supposed to forget something. He was so busy talking he didn’t hear what I was saying. One should not let knowing a little bit be a substitute for learning more. Life has been a rough draft of the place just ahead where the past will come alive again. Each artifact that is not recovered is a book that will not be read. Sitting quietly can bring many smiling rewards. How do you know where the edge is, if you don’t go out there and look? Having enough money is much better than having a lot of money, because casual cash propagates idle fingers. Gaining experience isn’t always peaceful. An interesting phenomena of homo sapiens as a species is that they will find a way to argue a point even when none exists. Live on in groves of human thought. Sometimes principle is reason enough to abandon logic. Stay in your job only if you love it. Get out in the mountains and turn a log over to see what’s there. Avoid those things that distract you from your self-esteem. The key word is contentment. If you can find it, everything else has already fallen in place.